As long as the wind has blown, people have been finding ways to harness its energy to powerboats, pump water, or grind grain. Humankind has had an on-again off-again relationship with wind power throughout history, making incremental advances each time interest in this valuable resource peaks. Over the last century and a half, we have made great leaps in our use of wind power with innovative designs and advancements in technology. In the mid-19th century, the formation of the U.S. Wind Engine & Pump Company marked a commercialization of the market that may look surprisingly familiar to us today. Daniel Halliday, an American engineer, patented a windmill design ideally suited to the American West. This design—a unique windmill that automatically turns to face changing wind directions—was used by farmers and railroads to pump large amounts of water. By 1881, the U.S. Wind Engine & Pump Company was the largest institution of its kind. 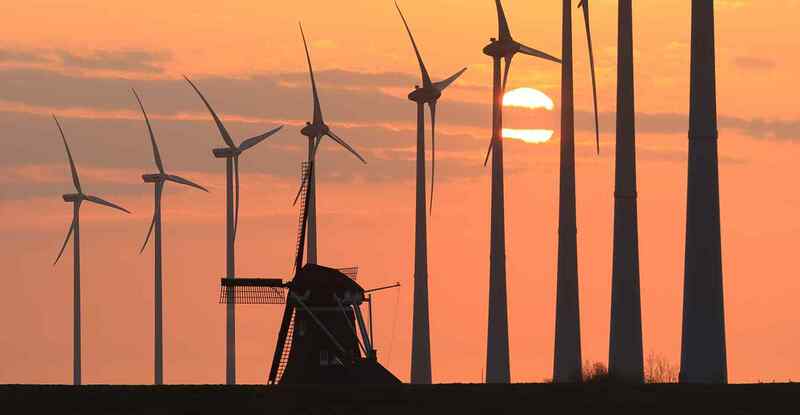 In the latter part of the century, steel blades made the windmills more efficient, and larger designs, called wind turbines, produced even more power. Throughout the first half of the 20th century, interest in wind power waxed and waned based on the availability of other energy sources, and by the 1950s most wind turbines had been shut down due to disuse. As the availability of oil plummeted and prices skyrocketed in the 1970s, interest in alternative energy sources such as wind power again began to rise. Partnerships were formed between industry leaders and the U.S. government to further develop and advance wind turbine technology; in fact, NASA even oversaw a program to create utility-scale wind turbines which pioneered multi-megawatt technology still in use today. This program brought us massive turbines whose scale set records for both diameter and power output. Though focus on wind dipped again over the following decades, incentives and funding in California kept wind research moving forward with the first major use of wind power for utility. Today, wind power is the number one source of renewable energy in the U.S., pumping out enough capacity to power more than 15 million homes. Average rotor sizes have doubled since the 1980s, and today’s wind turbines can produce 15 times more power than the average turbine did in 1980. While progress seems to be on an ever-increasing trajectory, there are some challenges to maintaining the fever pitch of advancement we’ve seen over the past decades. While the potential for wind power is a jaw-dropping 10 times our total current power consumption, the most ideal areas for wind power are located far from the high-capacity grids they need to supply. To overcome this challenge, general consensus is to build taller towers with longer blades that can take better advantage of the high wind speeds that occur at altitude; but manufacturing challenges—more materials and higher costs—and the use of blade materials that are unable to withstand high stresses make for additional complexities that could seemingly hold back a ramp-up in this valuable industry. In the pursuit to make wind more cost competitive, manufacturers have looked for ways to effectively produce longer blades. Longer blades provide a larger wind swept area and therefore greater energy capture. Their weight, however, rapidly compounds as blades lengthen—ultimately leading to what seems like an engineering impossibility. To solve this problem, blade manufacturers have turned to higher performance materials: epoxy replacing polyester and carbon fiber supplementing glass fiber. These more expensive materials deliver the enhanced mechanical properties required to continue pushing the length envelope. But these materials have limits too. Longer blades travel at higher speeds – making the ends of the blades experience much more stress. This added stress creates additional fatigue on the blade, resulting in increased wear on the blade material. And while lighter materials are generally the ideal for making longer wind blades, the lighter materials are generally less able to withstand the strains of high stress. So does this mean we’ve hit a wall on wind blade length? In the pursuit of larger, lighter, and more durable blades, independent blade builders and integrated turbine providers have turned from polyester-glass to epoxy-carbon/glass hybrids. Taking a next step in wind blade material advancement, Materia has developed Proxima® thermoset resin systems, a high performance composite resin platform. With higher toughness and improved fatigue properties to support additional blade length growth, Proxima thermosets also offers water-like viscosity at room temperature, which facilitates the manufacturing of these blades with amazingly fast resin infusion times. When combined with accelerated cure packages, mold throughput is dramatically increased while production costs are decreased. As blade designers and turbine OEMs continue to pursue new solutions for increased output, scientists and researchers like those here at Materia continue to push the envelope, developing the next generation of technologies that will someday help to power society. For more information on Materia’s Proxima family of resins for wind, or to see how we work with our customers to provide custom solutions that fit every need, contact us directly.